Free File is IRS’s reliable tax preparation and filling platform designed to allow USA taxpayers to prepare and file federal individual income tax returns for free. The service is a partnership between the International Revenue Service (IRS) and the Free File Alliance; a union of the leading private sector tax preparation institutions which provide commercial online electronic filing and tax preparation for free. IRS Free File provides two solutions to taxpayers; the Free File software which is filed via a brand name software and the Free File Fillable Forms which is filed via online fillable forms. Both options offer the federal efile solution for free. 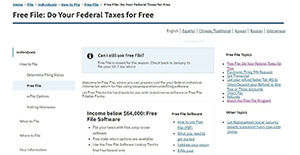 In addition, the Free File Software is engineered for taxpayers with an income below $64, 000 whereas the Free Fillable Form is crafted for taxpayers with an income above $64, 000. IRS Free File is a robust platform that provides taxpayers with a convenient way to file their income tax returns. The program doesn’t advocate for a specific Free File Alliance company. Instead, the program allows taxpayers to choose their preferred company to prepare and efile tax returns. When this program is combined with the direct deposit, it offers the safest and quickest way to obtain a refund. In addition, this tax software features a question and answer format which is instrumental in helping eligible taxpayers to find tax breaks. Some of the possible tax breaks reserved for taxpayers could consist of credits like the earned income tax credit and more. The best thing is that the software select the most appropriate tax forms for your and performs the calculation automatically and accurately. Another notable benefit is that this platform is free for all taxpayers. If you earn an income of $64000 or below the brand name software gets you covered. On the other hand, if you earn an income of more than $64000 the Free File Fillable Forms is designed to help you out. The Free File Fillable Forms offers taxpayers a convenient way to fill IRS forms electronically. It is an excellent option for taxpayers used to preparing and filing income taxes on their own. Additionally, the easy online extension is a great prospect. If for any reason, you fail to finish your tax return by the deadline (April 18) you can request a six-month extension using the Free File. However, the extension to file your returns will not mean an extension of the time to pay. If you are interested in Free File it could also be sensible to examine other subcategories of Best Tax Software listed in our database of B2B software reviews. Since each enterprise has unique business wants, it is advisable for them to desist from seeking a one-size-fits-all faultless software application. Needless to say, it would be useless to try to find such a system even among market-leading software applications. The smart thing to do would be to jot down the various important factors that require consideration such as key features, budget, skill levels of employees, company size etc. Then, you should do your research thoroughly. Read some Free File reviews and look into each of the other apps in your shortlist in detail. Such comprehensive research can make certain you weed out ill-fitting applications and choose the solution that presents all the aspects you require for business success. How Much Does Free File Cost? We realize that when you make a decision to buy Tax Software it’s important not only to see how experts evaluate it in their reviews, but also to find out if the real people and companies that buy it are actually satisfied with the product. That’s why we’ve created our behavior-based Customer Satisfaction Algorithm™ that gathers customer reviews, comments and Free File reviews across a wide range of social media sites. The data is then presented in an easy to digest form showing how many people had positive and negative experience with Free File. With that information at hand you should be equipped to make an informed buying decision that you won’t regret. What are Free File pricing details? What integrations are available for Free File? If you need more information about Free File or you simply have a question let us know what you need and we’ll forward your request directly to the vendor.